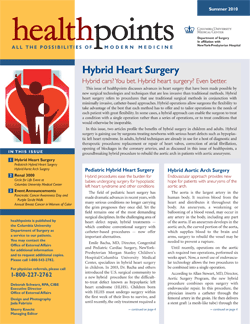 Hybrid Heart Surgery: This issue of healthpoints discusses advances in heart surgery that have been made possible by new hybrid heart surgery procedures. Pediatric Hybrid Heart Surgery: Hybrid procedures ease the burden for babies undergoing surgery for hypoplastic left heart syndrome and other conditions. Emile Bacha, MD, specializes in hybrid heart surgery in children. Hybrid Aortic Arch Surgery: A new hybrid procedure combines open surgery with endovascular repair, significantly shortening the length of the procedure, reducing risk, and making for a shorter hospital stay and a more rapid recovery. Renal 3000: The Circle for Life event at Columbia University Medical Center: celebrating a milestone in kidney transplantation.